Most Rotarians know that Paul Harris was the Father of Rotary. He is credited with the idea for the club and today he is ‘Mr. Rotary’ to millions of Rotarians. The Chicago Rotary club was an immediate success and it achieved all that Paul Harris could have hoped for and maybe even more than he had imagined. However, by 1909, several other business men in other cities had heard of the new Chicago Rotary club and they wanted to know more about the organization. Paul Harris was receiving letters from all over the United States asking about creating new clubs and when the second club was chartered on November 12, 1908 (San Francisco) it created an explosion of interest and letters came pouring in to Paul’s office. The work to charter new Rotary clubs brought new challenges and tasks for the organization. Chicago Club President ‘Red’ Ramsey asked a member, Chesley R. Perry, if he would take charge of club expansion or ‘extension’. Ches, as he was known by his friends, accepted. It would change the course of Rotary. Ches Perry was not one of the original charter members,…not even close. He joined Rotary in late June of 1908, over three years after the organization was born. When he was asked to take on the leadership of chartering new clubs he had been a Rotarian for just over a year, but he was the right person for the job. Ches took on his task as if Rotary was his idea. At the end of his work day he would go over to Paul Harris’ office and work long hours with Paul responding to all the letters coming in from potential club organizers. Paul and Ches became a team that laid the groundwork for what was to come. Within months after the San Francisco club was chartered four more clubs were organized in Oakland, CA; Seattle, WA; and Los Angeles, CA. By the fifth anniversary of Rotary (February 23, 1910) 12 clubs had been chartered but each club was an independent organization that adopted the Chicago Rotary club’s Constitution. The first club had been the central focus and contact for all the new clubs, but there was not a unifying organization. Now a new dilemma surfaced. The Chicago club had become the primary entity for a rapidly growing group of Rotary clubs, but that was not the purpose of the original club. It was time to create an umbrella entity that would act on behalf of all existing clubs and qualify new clubs. It was decided to hold a convention of all Rotary clubs to establish a national Rotary organization. The task of planning a three-day convention fell to largely Ches Perry. Like so many great Rotarians, Ches didn’t hesitate to act when action was needed. What followed was a transformation of Rotary. The first convention was held on August 15-17, 1910 and the Rotary clubs immediately elected Ches to be the chairman of the convention. The representatives then established the National Association of Rotary Clubs of America. Paul was elected as its first President and soon after the convention the new Board of Directors asked a young 33 year-old Ches to temporarily serve as Secretary. He accepted and then served in that role until 1942 when he retired at age 65. Ches created the Rotarian magazine (then called the National Rotarian) that every member now receives monthly. When Paul took a ten-year absence from Rotary in 1912, it was Ches that kept the organization moving forward. It may be that someone else would have stepped into the role instead of Ches and kept the main cog of the Rotary organization well oiled and in motion, but it seems that Ches was exactly the right person at exactly the right time. 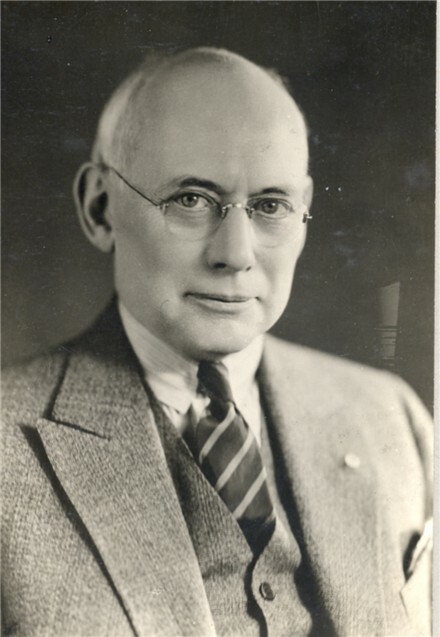 As we approached the Centennial of the first Rotary Convention, let’s remember the person who cared and nurtured our organization during its most formative years: Chesley R. Perry.